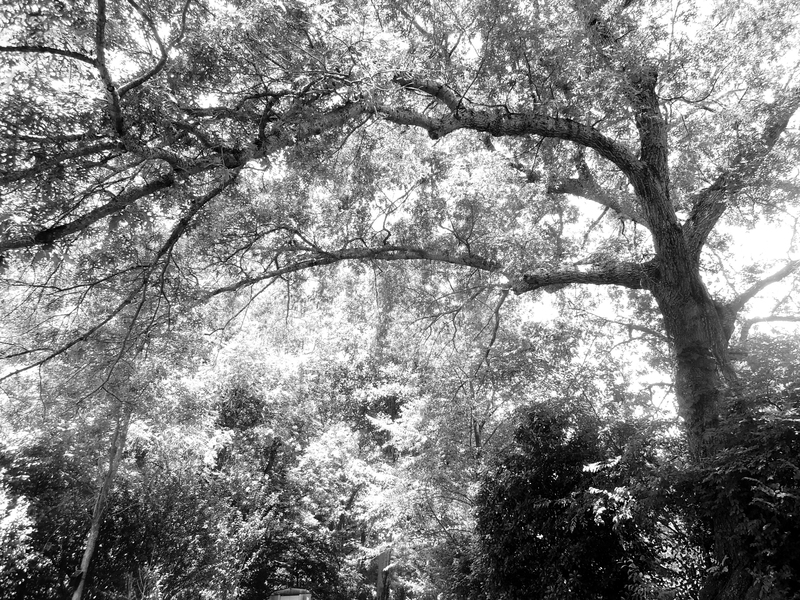 I wanted to write something about the tree in my back yard. It is a big red oak, growing on the hill that rises at the back of our house in the Blue Ridge Mountains of North Carolina. It is an old tree, with wide-spreading branches that swoop out over us like wooden contrails against the sky. It is a sky tree, high up over us, elevated by hill and by tree trunk. Its bark is shingled and cracked. Its leaves in summer are insect-eaten, dry and leathery. Moss grows on the north side of its lower stories. It dominates the small hill like “Charlemagne among his peers.” All lesser vegetation remain vassals, and the lawn mere peonage. One sees on its trunk the evidence of cities of insects, largely black ants, which use its bark for highways. At night in June, fireflies act as streetlamps. One could look at the tree and think it is just an old-growth oak. There are many such trees in the mountains. They grew back after the farms that covered the area fell into disuse decades or centuries ago. Now that old growth has been parted again for housing developments, but my one old tree survives. It is hard not to think of it as an individual and not merely a Quercus rubra, something from a page in a Peterson Guide. It seems to be a kind of spiritual umbrella, protecting this house from whatever ashfall of misfortune may drop from the heavens. The back yard is full of vegetative growth, each shoot contending with the rest for sunlight and water. Grandfather oak watches over the welter. It is a mythic tree. The world is filled with such mythic trees, from Yggdrasil, the Viking “World Ash Tree” to the Boddhi tree of the Buddha. Most fall into one of two varieties of tree in myth: the fruit tree of paradise or the druidic oak that marks the axis of the world. 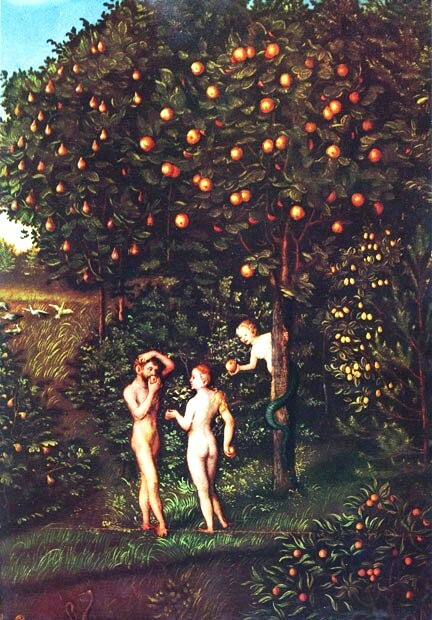 Of the first, the best known is the tree of the knowledge of good and evil from the Bible, although only close readers of Genesis may notice there is yet another fruit tree there, the tree of eternal life, which the god does not forbid Adam and Eve, although they never get to test it. Such trees of fertility include the vines that Bacchus makes grow on the pirate ship and the trees of life in Mexican folk art. 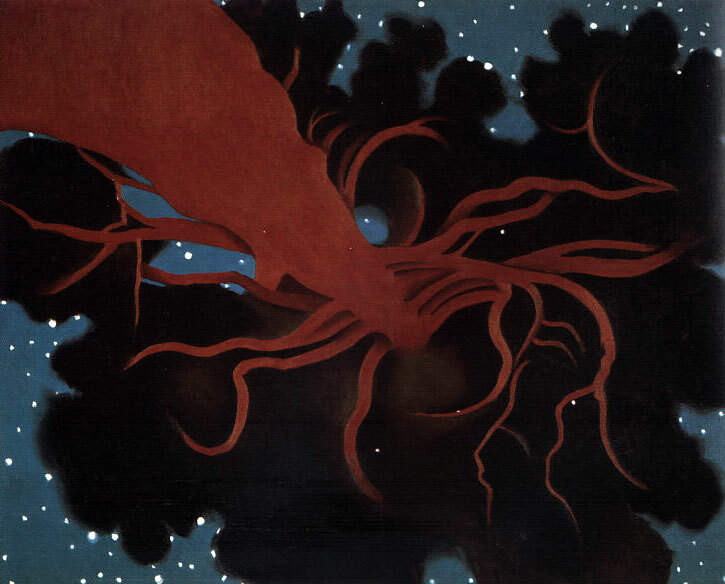 But my tree is the other kind, like an Ent from Tolkein, or the so-called “Lawrence Tree” in New Mexico, painted by Georgia O’Keeffe. This is not a tree of beginnings, not a tree of new fruit, but the kind of tree that functions as a “witness.” It sees all that happens. It cannot change what happens; it cannot interact. But it knows. What it knows, we mere humans can never fully know, but myth tells us over and over, it is not necessarily a happy knowledge. The Garden of Eden may have contained the tree of immortality, but my tree tells me of a longer time, when everything passes. It is a tree of the knowledge of death. What makes such a tree notable is that it does not comment on this fact: It just is. That is its role as witness. It sees the suffering and knows it cannot be otherwise. It sees the long time, when whole empires are born and vanish. Perhaps even the time when the cosmos explodes into existence and then fades like a dying ember into a wash of undifferentiated particles, the ash of the burned out universe. This is why that Odin chose Yggdrasil as the tree on which to hang himself as a sacrifice to himself, to gain wisdom. And it is perhaps why Odin is not portrayed as a happy god. That is my tree in the back yard, today dripping with the sweat of rain in the summer heat, in a humidity so thick it is almost a mist. As you read this, you think, but it’s just a tree. And so it is. All mythology comes not from the things themselves, but from our investing them with significance. They seem to have meaning. It can be like a dream, which, when we wake we remember and feel was trying to tell us something important. We don’t know what, but we felt its meaning. And myth is that state, in waking life. Things are what they are, but they are also what else they are. This may be something like a schizoid state, but it is where art comes from, and after art, where myth, and later religion comes from. Myth is our sense of the importance of things. Not important, like the paying of monthly bills, or remembering a wedding anniversary, but important in and of itself. It is significance. You can see it in the utter care and utter frenzy of the paintings and drawings of Vincent Van Gogh. (Really, in every artist, whether Titian or Joseph Beuys). 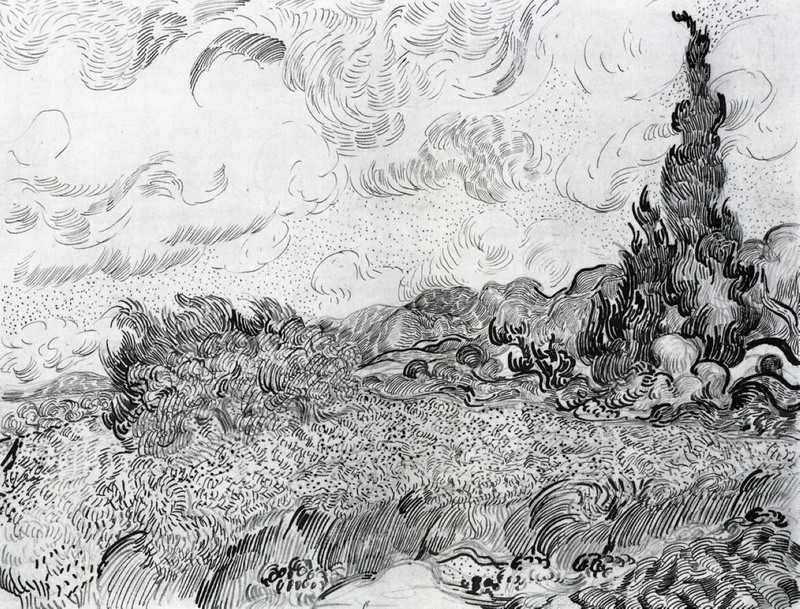 Look at those lines of energy as Vincent draws cypress trees. This is his recognition that every bush is the burning bush.